Jane Austen died exactly 200 years ago today. Really! So I can't keep from kvelling while remarking on how "bashert" this is ("meant to be") given that today, July 18, 2017, falls midway between this year's readings of Parsha Pinchas and Parsha Mattot/Mas’ei (the final two readings in the Torah's Book of Numbers). In January, 2002 -- over fifteen years ago -- I began to do serious research on the beloved Broadway Musical Fiddler on the Roof. In 2003, when I submitted the first of several book proposals to a potential publisher, I already knew I wanted to call attention to the parallel narrative trajectories of Elizabeth Bennet -- the second of the five daughters in Pride and Prejudice, and Hodel -- the second of the five daughters in Fiddler on the Roof. I kid you not! I knew this, I always knew this, from the very beginning of my research... But I was never sure why. I proudly submit the evidence to you in honor of Jane Austen's 200th Yahrzeit. 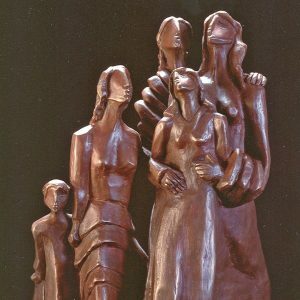 The answer to the mystery lies in the story of the five Daughters of Zelophehad (pronounced ZelophKHAD) – Mahlah (pronounced MakhLAH), No’ah (pronounced NoAH), Hoglah (pronounced KhogLAH), Milcah (pronounced MilCAH), and Tirzah (pronounced TirZAH). Is it possible that Jane Austen -- the daughter of a rector of the Anglican church -- did not know about the story of the five Daughters of Zelophehad when she wrote Pride and Prejudice? Of course she did! It is no coincidence that the Bennet family has five daughters (and no sons). And where in the Bible is the story of the five Daughters of Zelophehad told? In Parsha Pinchas (Numbers 25–29) and Parsha Mattot/Mas’ei (Numbers 30–36). And this year, on the Hebrew calendar for 5777, these are the two parshot that surround the 200th anniversary of the day Jane Austen died. Really, sometimes truth IS stranger than fiction! I am totally convinced this is correct. 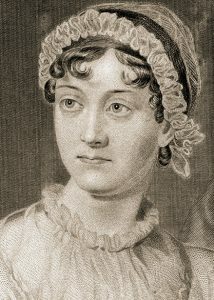 Jane Austen! As we say in the Jewish world: "May Her Memory Be for Blessing." 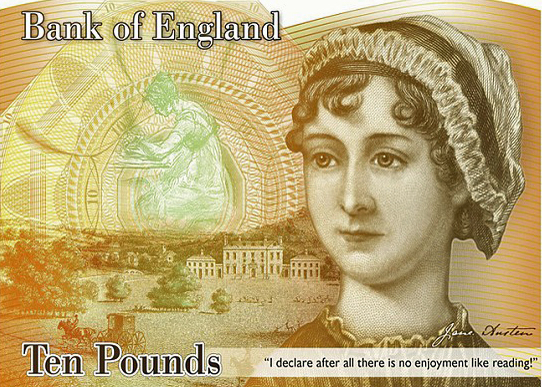 Featured Photo: The new £10 Note was unveiled today in honor of the 200th anniversary of Jane Austen's death. These new notes will begin circulating in September. 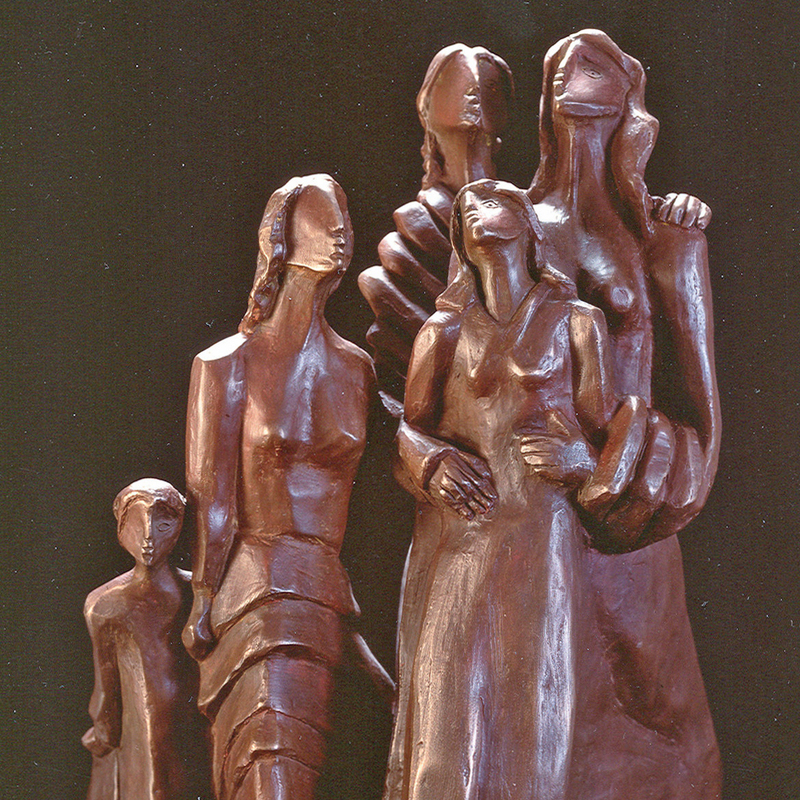 Middle Photo: Sculpture "Daughters of Zeophehad" by Judith Klausner. Posted with permission. All Rights Reserved! 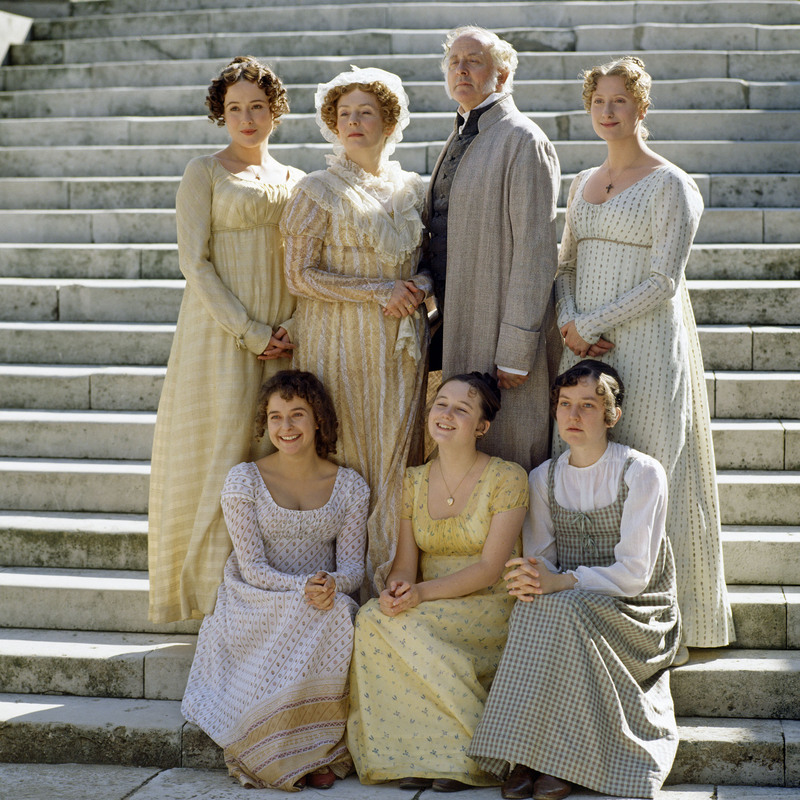 Bottom Photo: The Bennet Family in the 1995 BBC adaptation of Pride and Prejudice. Property of the BBC. Posted with permission. All Rights Reserved!